Besides the general strategies, we want to introduce you to some strategies that specifically apply to both Android and iOS apps. Connect your marketing campaign with Google Adwords! This online advertising tool by Google lets you promote products via various ad formats, displayed on different channels. You can promote Android apps with it, too. This option enables you to promote Android apps via different ad formats and on several networks available by Google. Text and visual elements are taken from your app’s app store page (one more reason for ASO). This campaign type is based on a CPI bidding system, meaning you can choose how much you are willing to pay for users installing or opening your Android app. This way, you can promote your Android app and increase your marketing budget if the results are satisfying. With such campaigns you only target one network to generate app installs. Depending on the specific campaign model, you can choose between CPA, CPV, and CPI as your bidding option to promote your Android app. According to your Android app promotion strategy and your target audience, you can select the campaign type that best fits your needs. With Google’s bidding system, you can adjust it to your current marketing budget. Click here for more information about mobile app installs campaigns with Google AdWords. With Search Ads, iOS app developers are able to place their app on top of search results. Since more than half of app downloads are generated through search in the App Store, this is one great opportunity to promote your iOS app more effectively. With its self-service dashboard, creating a Search Ad campaign is very easy. There is no minimum spend for it and costs only incur when users tap the ad. Apple has set a bidding system for this feature, which makes it possible to set a price according to your current budget. In combination with ASO, you can take advantage of your app’s information (e.g. description) and graphics (e.g. screenshots) through “Search Match”. This feature takes metadata of the app from the App Store for your iOS app marketing. You can also either use keyword recommendations made by Apple or select keywords on your own, just like Google AdWords. It is not possible to change the ad creative, this data will only be taken from your metadata. Furthermore, relevance is more important than bidding regarding apps being displayed via Search Ads. Here, Apple again shows that it prefers high-quality to monetization. Hence, when you’ve already done a great job with your ASO, you can draw on it. Check out Apple’s website for more detailed information. This is no direct promotion tool for app developers but it may attract them to create the best app possible. Apple’s editors choose great iOS apps continually that are displayed in these special sections of the App Store – so Apple will promote your iOS app. Next to its appearance, features and quality, your app can also get the chance to be placed by lowering its price for a limited time. So, consider offering a discount from time to time. they will download your app out of true interest and without being rewarded (non-incentivized). Both types have different advantages and disadvantages. In general, you can choose between two app promotion strategies when driving incentivized installs for your app. One of them is based on the amount of installs generated in a certain time whereas the other one considers the loyalty of your users. The CPI (=cost per install) for incentivized installs is way cheaper than that of an app promotion strategy only based on non-incentivized ones. The downside of incentivized installs is that users might download and install your app only for the reward, resulting in less user engagement, lower lifetime value and smaller retention rates. The advantage on one side is the disadvantage on the other: Since users won’t receive a reward for installing your app, you have higher costs in order to generate the same amount of installs of an an incentivized campaign. If you’ve just started your app business, this could take a big chunk of your marketing budget. Now, the most important question needs to be asked: Which type of install is suitable for your app promotion strategy? Can you choose a method where you only deal with the benefits and leave the drawbacks behind? Take advantage of both of them. The mixture of rewarded and non-incent installs helps your app marketing strategy gather pace up and your app will climb up the charts. The main goal of app marketing is to acquire new users but there are various ways to advertise an app. These not only differ due according to the ad format, but also according to who is carrying the risk – the publisher or the advertiser? With this app marketing campaign type the advertiser pays the publisher for every generated install (CPI). The install can be rewarded for the user or be of non-incentivized nature. If the advertiser wants the campaign to be incentivized, he/she can expect the download rates to be very high. Users install the app in order to get the reward. For the publisher, incentivized installs are quite interesting, because they only want to deliver installs and do not care about what happens after the installation. For marketers, non-incentivized installs are more promising because a targeted group of users downloaded the app of their own interest. This results in higher retention rates and consequently a higher revenue for the developer of the app. So, the difference between rewarded and non-rewarded installs also underlines the shifting of the carried risk between marketer and publisher. Rewarded installs pose a low risk for publishers but a high risk for the advertiser. Non-incent installs imply a high risk for the publisher, (as it is not clear what percentage of his/her audience will install the advertised app) and low risk for the publisher. Action campaigns offer a reward to the user, as there is always an objective the user has to fulfill. This mobile campaign type allows the advertisers to spend budget only if the user has fulfilled a specific action in their app. Like that, he/she gets to know the product a bit better and might continue to use it. Although the risk for the advertiser is the same as with incentivized install campaigns, the audience of the publisher might only take the action to get the reward. From a marketing point of view, videos as advertisements are very unique because it is so versatile to monetize and to calculate the bid. What advertisers should know first: a study showed, that 71% of mobile game players think that video ads are the preferred way to “pay” for an app. When using video ads, marketers can also choose to reward users or to leave it non-incentivized. The possibility to choose the right bid-type is what makes it special. The three main bid-types are Cost Per Install (CPI), Cost Per Click (CPC) and Cost Per View (CPV). Here, the model cost per install is used in the same way as in the install campaign. CPI video ads can be both rewarded and non-incentivized: the advertiser pays the publisher for delivered installs. The CPC bid-type only pays the user when he/she interacts with the ad and gets directed to a landing of a mobile browser or the page of an app store. As the action of clicking implies less work for the user than installing an app, the reward is a bit smaller. This can also mean that the user interacting with the video is generally interested in the product. The same applies to non-rewarded video ads. With this mobile campaign type, the publisher carries the risk and the advertiser only pays when a user interacts with the ad. create videos for your app store page. With all these methods, you are able to give more detailed insight into the functions and benefits of your app. If you create a professional and compelling video, it might just convince users of downloading your app! A rewarded video is short video clip, on average 15 to 30 seconds long, that is non-skippable and designed for in-app environments. It offers users a reward in return for watching the video, though the download itself is the user’s choice. Thereby, it represents a mixture of incent and non-incent advertising. That is not the only feature of rewarded videos: they also provide huge advantages for both the user and the advertiser and benefit them alike! On the user’s side, they interact with this ad format by choice since rewarded videos are fully opt-in. Users only have to watch the video if they want to receive the reward. Hence, this format doesn’t disrupt the user experience but increases user engagement with the advertisement. On the developer’s side, this last point is very important: higher engagement rates also mean increasing revenue and higher viewability rates for advertisers. This interplay of both sides allows advertisers to monetize their app through advertisements without disturbing the experience for the user. 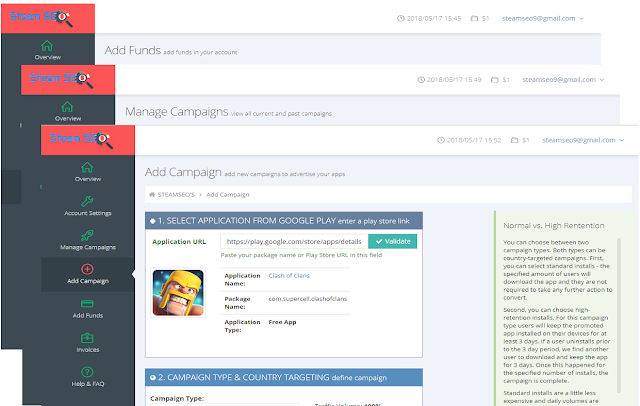 There are many more campaign types you can use to market your app. Knowing how to calculate your budget is crucial when wanting to conduct successful app marketing. First, you should select your key performance indicators (KPI) upon what you would like to achieve with your app. Following, we are going to present to you some of the most common calculations that you can use to calculate your budget for your user acquisition strategy. The cost per install (CPI) measures the app marketing costs for ads that trigger an installation of your app. CPI varies a lot according to the ad formats you use. If you are using non-incent banner ads, you will most likely pay more for each install than when buying downloads via an incentivized offerwall. If you use an incentivized offerwall you can calculate very precisely how many installs you will get for a certain amount of money. This simple yet interesting formula helps you calculate app marketing costs because you can measure very clearly how effective your marketing efforts are. It is not limited to a specific model like CPI or CPAU. For the mobile advertising industry, this pricing type is more commonly used for setting actions like completing a tutorial, reaching a certain level, registering an account or subscribing a newsletter. The cost per active user measures the app marketing costs for reaching users that will use your app actively. Every company needs to define for themselves what ‘active’ means. In this case, you might also hear the term ‘retention rate’. The average revenue per user is the amount of revenue each of your active customers (on average) contributes in a specific period of time. In this section of the article, we want to introduce and explain app marketing solutions that we developed for our customers. We prevent your ad spend from possible fraud with the help of proprietary technology, strong partners, and a dedicated team. We combine automated real-time data analysis and hands-on examination of accumulated historical data by our experts to identify abnormalities and fight publisher fraud. That way, we provide the highest level of security for your media buying. Additionally, you can monitor your performance and data in real-time with our dashboard. With our self-serving dashboard, we can provide our customers with full control over their media buying and marketing outcomes. You just have to setup a campaign by choosing a campaign type like install campaigns, engagement campaigns, banner ads or mobile video. If you want to target a specific audience, you can set granular data like targeting location, language, device, OS type and more. To guarantee a fully transparent campaign performance, we cooperate with third party tracking providers Appsflyer, Tune, Adjust or Kochava. Furthermore, with our dashboard, you can react to real-time reports fast and optimize across all supply channels.